Parents, low-income families, students, teachers and mass commuters are among those who will benefit from a $760 billion tax deal that was signed into law on Friday afternoon. The deal, which was combined with a $1.1 trillion spending package for 2016, is dominated by business tax breaks. But it also includes more than $250 billion worth of tax breaks for individuals. Bigger refund when you have kids: The child tax credit is intended to help offset the cost of raising kids. And it's refundable, meaning that parents can still claim the credit even if they don't end up owing federal income taxes. The amount that may be refunded is equal to 15% of earned income above $3,000. But that $3,000 threshold had been set to expire in 2017 and reset to $10,000, which would effectively reduce the refundable amount of the credit available. Under the new tax package, however, the $3,000 threshold will be made permanent. More generous tuition tax credit: College tuition is expensive, and the Hope Scholarship Credit helped tax filers offset that cost for years. Since 2009, that credit -- which is a dollar-for-dollar reduction of your tax bill -- was temporarily made more generous and renamed the American Opportunity Tax Credit (AOTC). The tax package makes permanent the expanded AOTC, which otherwise would have expired in 2017. With the AOTC, you may claim a tax credit worth up to $2,500 a year for qualified education expenses, subject to income limitations. Higher refund for low-income working families: The Earned Income Tax Credit is an antipoverty program designed to encourage and reward work, particularly for workers with children. In recent years, more generous but temporary provisions were set for parents with several kids and for married couples. Those more generous provisions had been set to expire in 2017, but are made permanent by the tax package. For married workers they include a higher income threshold above which the credit would start to be reduced. And the maximum credit for families with three or more children was raised to 45% of household earnings, up from 40% previously. Fairer treatment for mass transit commuters: Employers may offer workers a tax-free benefit to subsidize the cost of their commutes. With the benefit, the worker don't have to pay income taxes or payroll taxes on the money the employer pays to offset their commuting expenses. But the law allows a bigger benefit for those whose parking costs are subsidized than for mass transit commuters. A temporary provision in recent years established parity between the two. The tax package makes that parity permanent. So both drivers and mass transit riders will be allowed to exclude up to $250 a month in commuting costs. Permanent deduction for residents of states without income taxes: Tax filers who itemize deductions may deduct their state and local income taxes on their federal returns. A temporary provision gave filers the option of deducting either their state and local income taxes or their state and local sales taxes. That deduction was a boon for itemizers who live in Alaska, Florida, Nevada, South Dakota, Texas, Washington and Wyoming. Those are the seven states that don't impose an income tax but where residents pay sales taxes. It also may benefit many residents of Tennessee and New Hampshire, which only tax interest and dividend income, but not wages. Under the new tax deal, that sales tax deduction is now made permanent. Teacher deduction made permanent: Teachers in elementary and secondary schools who buy supplies for their classrooms with their own money will now permanently be allowed to deduct up to $250 for those expenses. The tax package also indexes the $250 cap to inflation and expands the list of deductible items to include professional development expenses. Deduction for mortgage insurance premiums: If you only put down a small amount to buy a home you may be required to pay for mortgage insurance to protect the lender against default. The tax package extends for 2015 and 2016 a temporary provision that lets you deduct the cost of your premiums if you itemize your deductions. How much you can deduct is subject to income limitations. Income exclusion for mortgage debt that's been forgiven: When you sell your home for less than what you owe the bank or your home goes into foreclosure, the bank may agree to forgive the remaining debt you owe. But the IRS typically treats that forgiven debt as taxable income to you. The tax package temporarily extends for 2015 and 2016 a provision that lets you exclude the forgiven debt from your income for tax purposes. Tuition tax deduction: Also extended for 2015 and 2016 is a provision that lets you take an above-the-line deduction for qualified tuition and related higher education expenses. Those eligible may deduct up to $4,000 -- or $2,000 if your income exceeds a certain threshold. Nice breaks but at what cost? 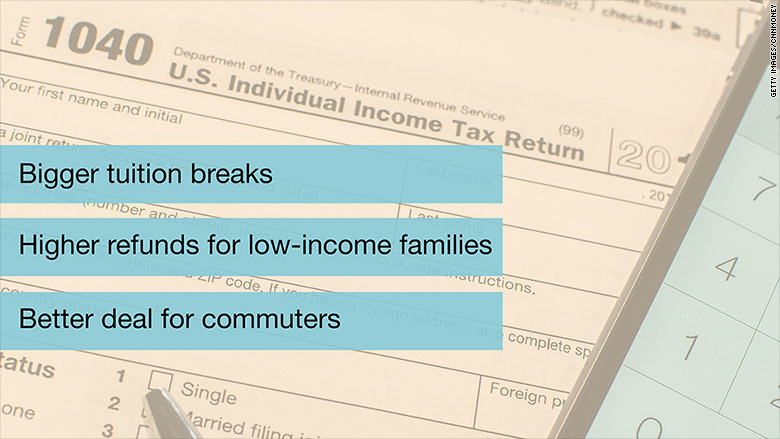 While tax filers may appreciate that many popular tax breaks have been made permanent, the changes aren't cheap. The Joint Committee on Taxation estimates it will cost $622 billion over a decade. But once interest costs are added, the cost approaches $760 billion, according to the Committee for a Responsible Federal Budget. And that cost will not be offset, which means it will be tacked onto the national debt. What's more, it effectively "squanders most of the hard-earned savings from either the 'fiscal cliff' deal ($800 billion in revenue) or the sequester (more than $900 billion in spending cuts)," said CRFB's president Maya MacGuineas.